If you’re a fan of the outdoors and are keen on getting a closer view of your surroundings whether it be for hunting, bird watching or even watching sporting events, then the best compact binoculars will be an invaluable product for you to have. In this article we will be looking at the things to consider before making your purchase, and providing the best compact binocular reviews to help you decide which are ideal for you. Binoculars are basically two small telescopes that are housed together, and by using lenses to magnify images so they appear much closer than they are in real life. They come in various shapes and sizes depending what you plan on using them for, so it’s important that you understand what each of the functions and numbers mean so you can choose the right product for you. Compact binoculars are great because they can fold away and don’t take up as much space as conventional binoculars, but with this comes a slight trade off in terms of the magnification you are able to get. What will you use the binoculars for? While a pair of compact binoculars will be handy in any situation, it’s worth considering what your primary use for them will be so you can determine what magnification you will require. The best bird watching binoculars, for example, will be light, portable, and easy-to focus so you don’t miss out. If you’re looking for binoculars to aid with watching sporting events, on the other hand, then the portability aspect isn’t as important, but you might prefer to use high powered binoculars to easily see the field of play. The environments you plan on using them in will mean some features become vital. If, for example, you will be searching through wetlands for that elusive bird, then you should have binoculars that are water proof as opposed to water resistant. If you’re moving around a lot you’ll want a product that is easy to handle and keep hold of, and is little effort to use once you have spotted something. Some compact binoculars are compatible with tripods, and some aren’t, and some are much more capable in low light environments than others.​ If you are simply looking for a pair of binoculars that you can take on your camping adventure, maybe a combination of all is a good option. It seems quite obvious, but you must make sure that the binoculars you purchase will have adequate magnification for your needs. It’s worth remembering that the more magnification you have, the heavier the product will be because it needs to house more lenses. It can be ominous, at first, trying to understand the different numbers associated with binoculars, but once you know what they are referring to it is easy. Every pair of binoculars is given two numbers, for example 10 x 25. The first number refers to how much magnification you will get, so if this number is 10 it means that the objects that you are looking at will appear 10 times closer to you. The second number refers to the diameter (in millimeters) of the main lenses in the binoculars. Both of these values determine how well the binoculars will work in various conditions. Lenses with wider diameters allow for more light to enter them, which is especially useful in low light environments. The larger the lens, though, the more cumbersome and weighty they become. Compact binoculars are designed with smaller lenses than normal ones to save on this space, and so are not as well suited to night-time activities. When you are using your binoculars you want them to be as comfortable as possible, while allowing you to look through them without interference from other light sources. You should not need to be pressing the lenses firmly against your eyes, instead there should be a small gap called the “eye relief”. Most binoculars will have rubber caps on the eyepieces to assist with this, but if you wear glasses you will need to get ones where these caps can be moved out of the way because your positioning will need to be slightly different. For the portability and convenience that you will gain by having a set of compact binoculars rather than a heavier product, there are certain design decisions that have been made that can reduce the quality of the image that you get at the end of it. One of the biggest factors is the way that the prisms are being used. Usually the main focal lenses will be wider than the eyepieces so the user will see a more three dimensional image. This is not always the case with compact binoculars, though, and they tend to use “roof prisms” that means the lenses are kept as small as possible and simply lined up with the eyepiece. This can result in poorer image quality. There are two different types of prisms that are commonly used in binoculars. BK-7 prisms are the cheaper option, and give a squared and less detailed image. The best binoculars for bird watching will, instead, use a BAK-4 prism, which offers a much rounder and sharper final image. These binoculars from Bushnell are a low cost option that is worth your consideration if you are looking for an entry-level model. They provide an 8x magnification that makes them ideal for bird watchers and concert goers, and are compact so won’t take up too much space. 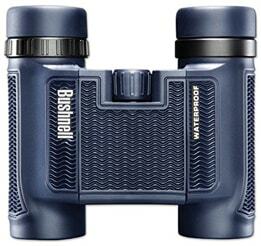 These binoculars use a BK-7 prism that is mounted on the roof to keep them lightweight. They are surrounded by a rubber armor to allow a firm grip and shock absorption, and the optics are fully coated to give you a clearer and brighter view. The rubber eyecups feel comfortable against your face, but they can fold down so are suitable for those who wear glasses as well. The center focus system is nicely designed to allow you to easily focus on an object. Be aware, though, that these binoculars are not waterproof or fog proof, and they are not compatible with a tripod. ​The overall design is really convenient. They weigh only 7 ounces, and are small enough to fit in the palm of your hand so will happily fit within your bag with all of your other equipment without taking up too much room. 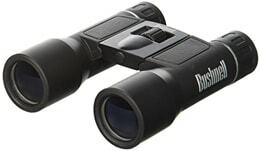 With these binoculars, Bushnell have designed a compact product while still offering effective magnification and a great image quality. They come with a convenient carry case and straps so you’ll be ready to take them with your wherever you go. With this model you get a 7x magnification and crystal clear image quality provided by the auto focusing Porro prism. There’s a 35 millimeter lens diameter, which means that more light is let in than other models to help sharpen the image. 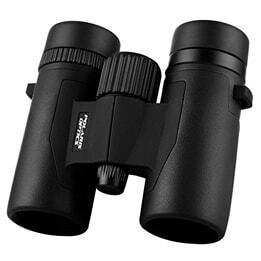 The rubberized body allows you to get a firm grip, and the eyecups help to hold the binoculars at the perfect position. If it’s too bright, or you wear glasses, these cups can flip to one side so they don’t get in the way. At 21 ounces, these binoculars won’t be difficult to carry around with you, or for continual use, and my favorite feature is the InstaFocus lever that helps you to intuitively focus in on whatever objects you are looking at. These are a great option for you if you want a competitively priced product that will give you great image quality, are easy to use, and are tough and durable. If you are a hunter, these combined with the best hunting boots, could give you are real edge on the hunt. If you are looking for some low cost binoculars that are compact and offer a good magnification, then you can’t go wrong with these ones from Aurosports. They are ideal for bird watching, sightseeing and for watching sporting events. 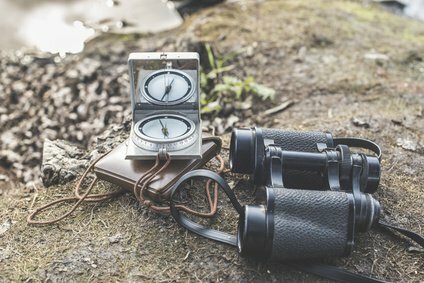 Only weighing 9.7 ounces, at 4 inches long they easily fit into the palm of your hands so are extremely portable, and you won’t find yourself being too concerned about damage because of their sturdy design, these are important factors in deciding weather these are the best compact binoculars for you. These binoculars also have a wide lens, which allows them to let more light in and means they are effective in low light conditions. To further help in these environments, they are coated with a red film to balance the light levels. The rubber body has been designed to fit comfortably in your hands and, by using a BAK-4 prism that is roof mounted, they offer a dual focus capability. With purchase of these binoculars you will get a strap, carry bag and lens cloth, so you’ll be ready to go as soon as you receive them. Bushnell have included a series of features into these binoculars to give you a lightweight and portable alternative to bulkier models, while still providing a sharp, clear picture. They use BAK-4 prisms that give a great quality image, and the lenses have been multi-coated to improve the transmission of light. 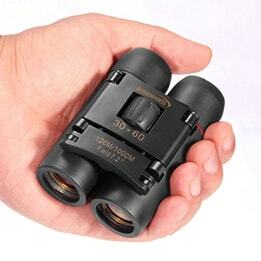 These binoculars are guaranteed to be waterproof, and the fact that they are O-ring sealed and have been nitrogen purged means that they won’t fog up either. The great thing about this product is that it can be just as easily used when you are moving around as when you are stationary. This means they are ideal for all activities, whether it be nature watching or at a concert. The non-slip rubber armor will keep them firmly in your hands, and the large center focus knob makes it simple to fine tune the image. The soft eyecups are gentle on your face, and can be twisted up so you can use them while wearing glasses or sunglasses. They have also been built to last, with the company offering a lifetime guarantee just in case they don’t perform as expected. 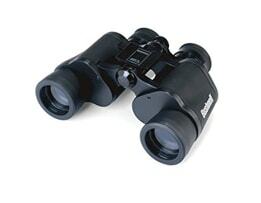 If you are willing to spend a little more for your binoculars, then these ones from Polaris are absolutely worth it. They are a slick design, offer a much sharper image quality, are easy and comfortable to use, and come full of useful features. First of all they are suited to all uses. If you walk across the wetlands in search of those elusive birds, these binoculars are lightweight, waterproof, fogproof and will withstand any knocks and bumps from being dropped. They have been designed to be extremely durable, and won’t simply fall apart at the first sign of stress. The 8x magnification is great, and you’ll be able to easily focus on animals or objects that are 1000 feet away from you. The BAK-4 prism allows wider views, so you can take in an entire forest-scape, or tighter focus so you can observe particular objects close up. Compact Binoculars are ideal if you want something that is easy to carry with you and pull out to use when you spot something interesting. They are not as effective as larger binoculars, but in most cases they will provide a perfectly adequate image. The best compact binoculars offer a great image quality, are lightweight, and an essential tool for birdwatchers and concert goers alike.